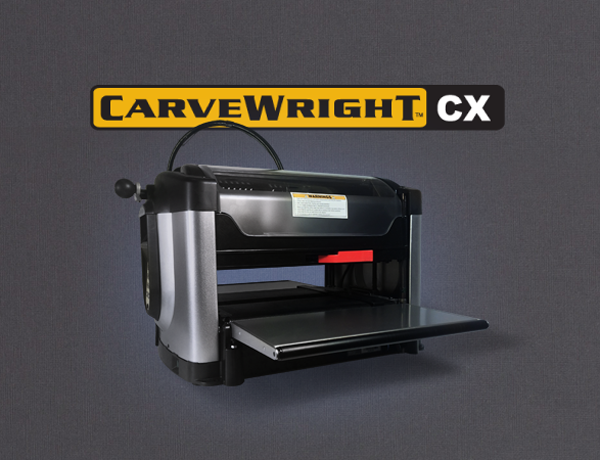 A quick project came up awhile back that I thought was a pretty cool use of my CarveWright. 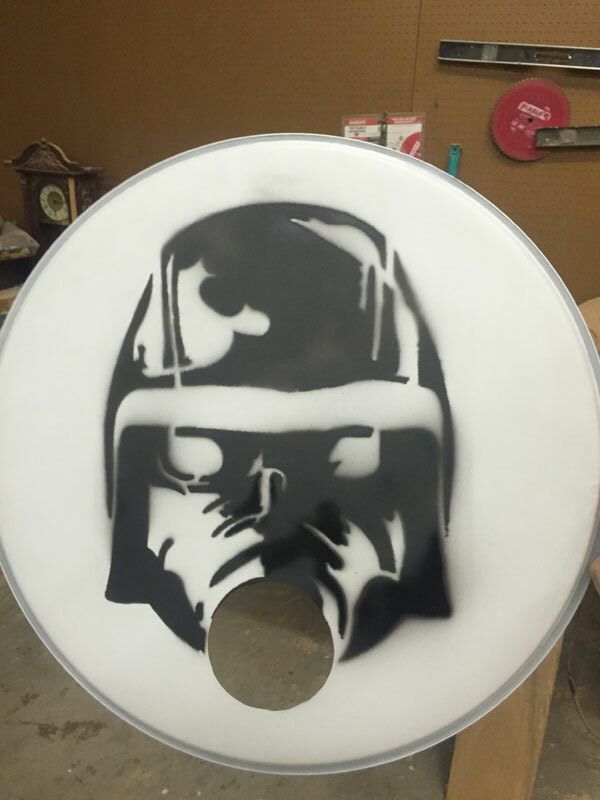 I play bass guitar with a band and we were discussing ordering a graphic printed bass drum head for this festival we were playing. We kind of dragged our feet and then there wasn’t enough time to order it. 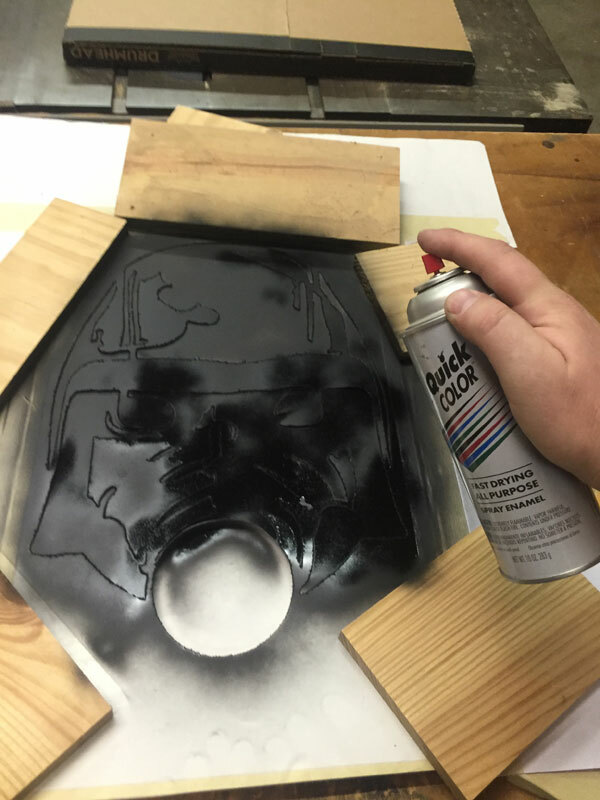 I still wanted to do something, so I had the idea to make a spray paint stencil. Worth a try, especially since I have a machine that does stuff like this. This machine. This is the one. 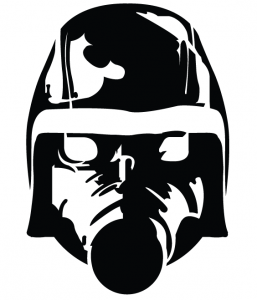 I had an image that we were using on the album and shirt of a gas masked and helmeted head. 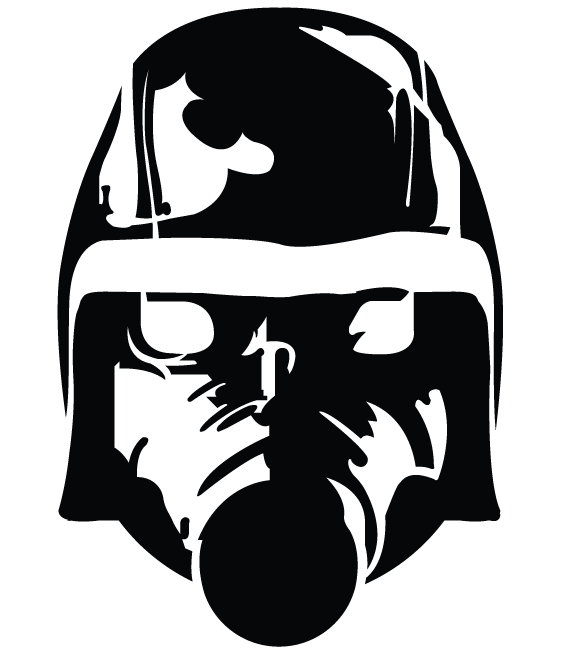 To make this a stencil took a little drawing work. A stencil has to be made so there are no islands, meaning no part can be free floating in the middle of a region. Everything has to be connected the outside edges in one way or another. Just think about what happens to all the parts when you cut it free and you’ll figure it out. 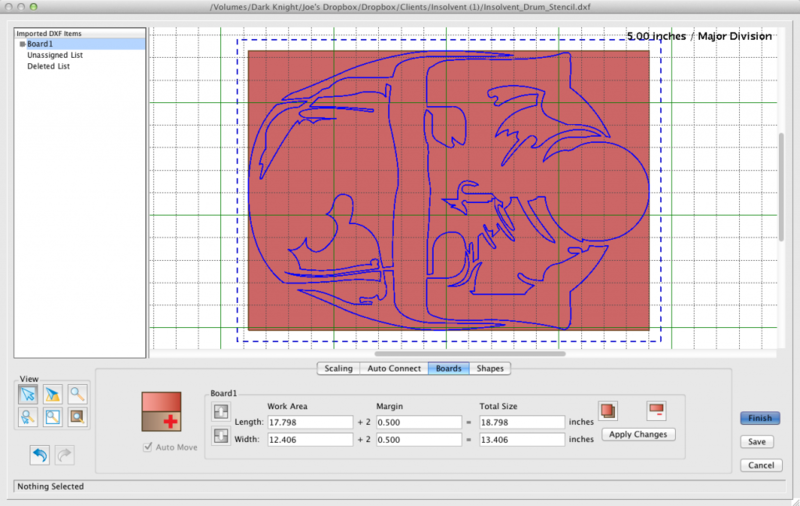 I did my drawing in Adobe Illustrator and exported it as a DXF. 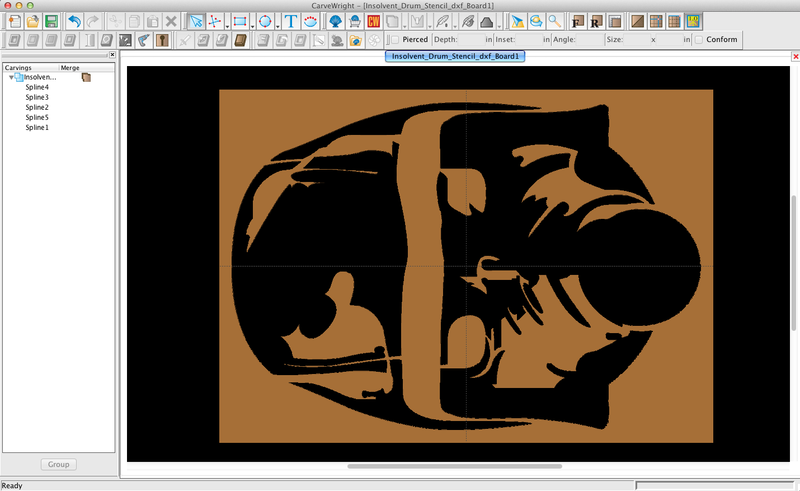 Using the DXF importer, I set my graphic size to fit the drum head, rotated it 90º, and clicked Add New Board. That’s it. No need to mess with any settings. Click finish and it’ll set up your project. 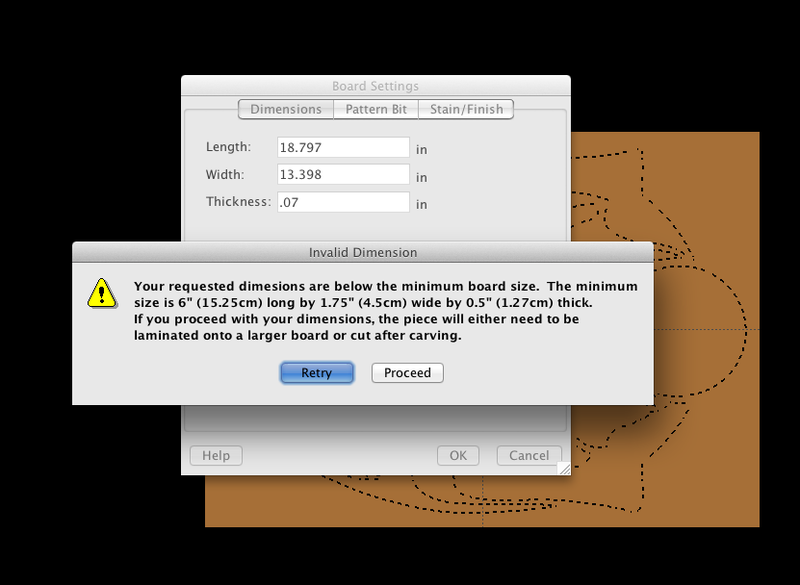 Once it’s in Project Designer, I changed the board thickness to .07″. 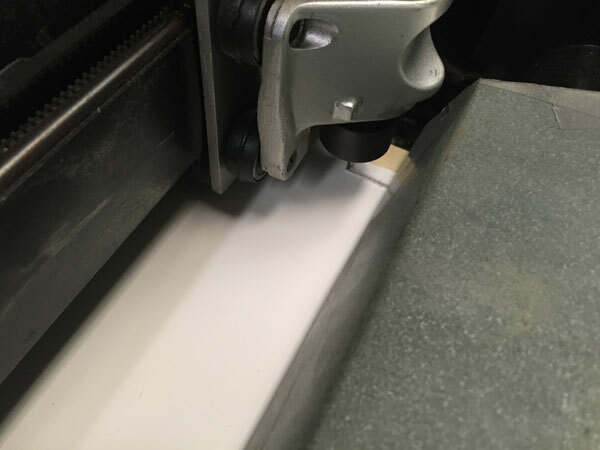 I planned to cut this out of poster-board around 1/16″ thick, so .07″ is slightly deeper to go all the way through. This is also the thinnest the software would let me go, so I didn’t really have a choice. Yes, I’m doing this on purpose. PROCEED! 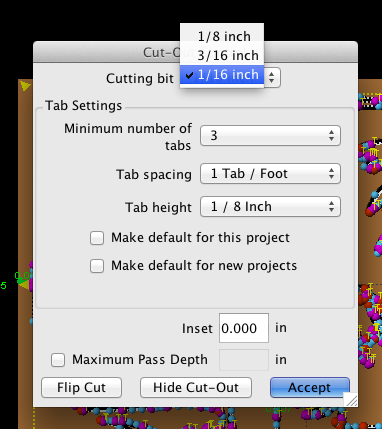 Next, simply click the Cut Path Tool and change to the 1/16″ Cutting Bit. Project is ready to go. Upload it and lets get our material prepped. This will need a backer board to affix the poster-board to. I had some laminated MDF around so I cut my poster-board down to fit it. Then I sprayed it all with a removable spray adhesive and taped down the edges with masking tape. Then load your project and watch it cut. NOTE: This paper may have been a little too thin for this. It worked, but I did get lifting off my backing board a lot causing some rough cuts. All that being said, it still came out great. I’d just like to experiment with more materials in the future to find a solution that stays put a little better. 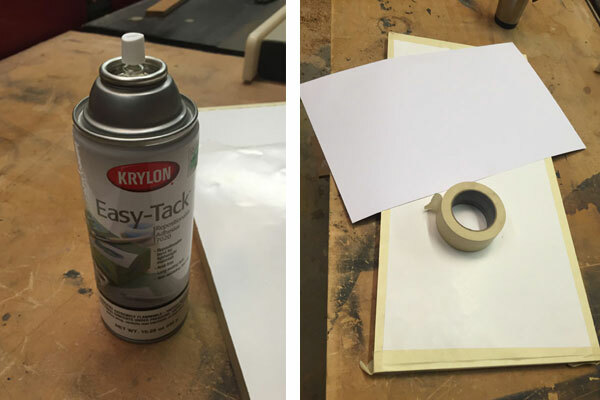 I used a knife to carefully cut the tabs and free my stencil. This turned out exactly as I was hoping. 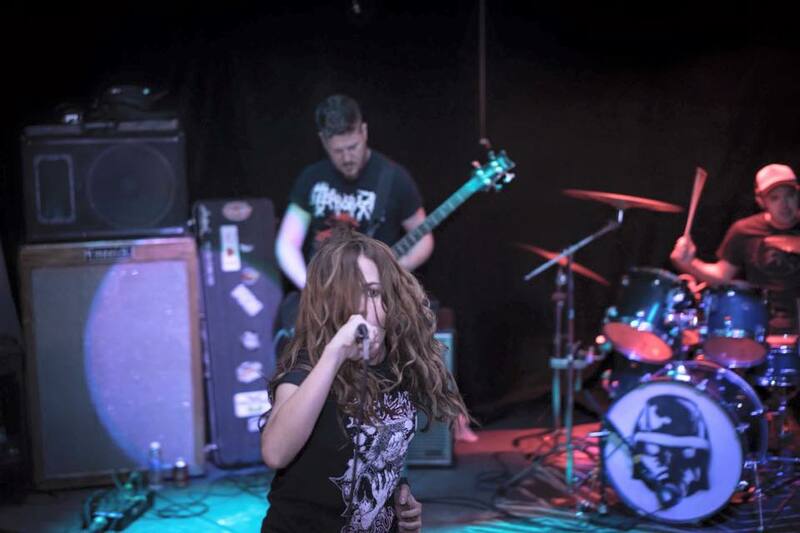 Looked cool on stage too! 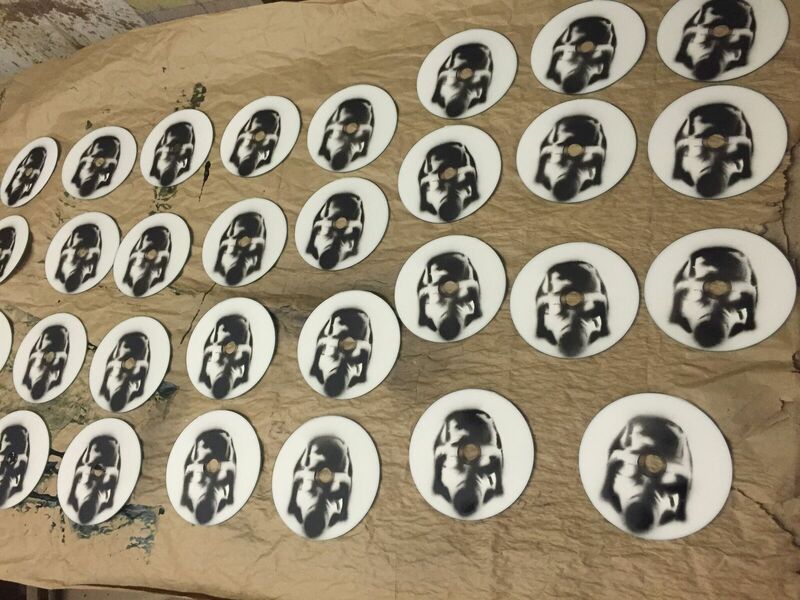 We liked the look so much, I cut a smaller stencil for our cd’s. 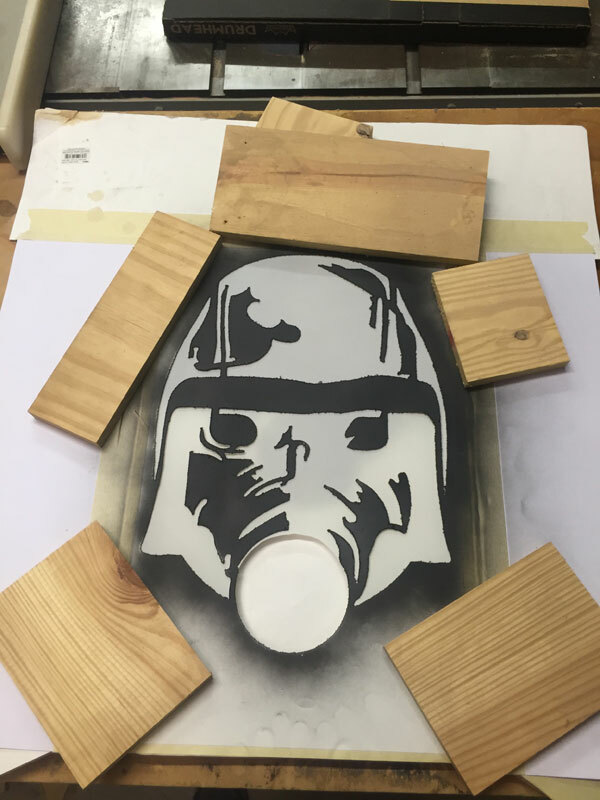 I’d love to see what other stencil ideas people have out there. It was such a quick process to do. A little more experimenting and I’m sure to get it perfected. I’ll keep you posted as to what I find out. This entry was published on January 26, 2018 / Joe Lovchik. 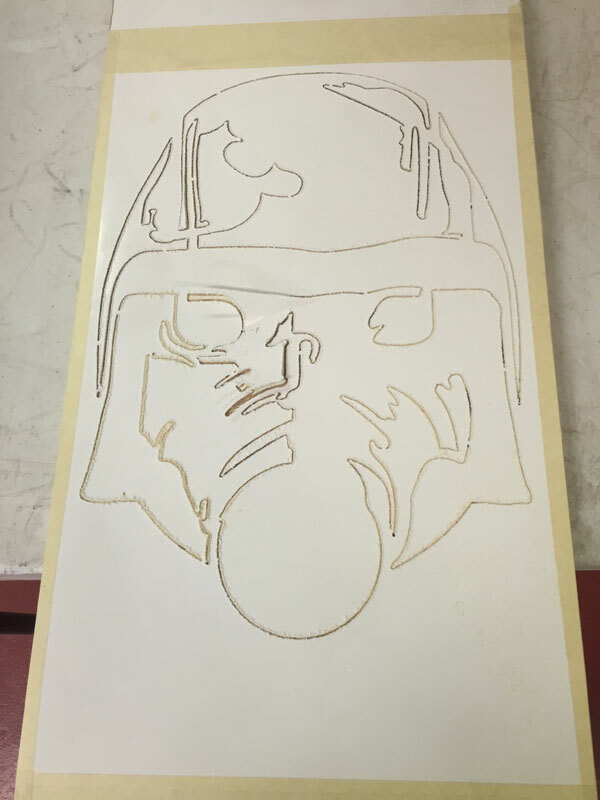 Posted in The CarveWright Build Blog and tagged cut path, stencil. Bookmark the permalink. 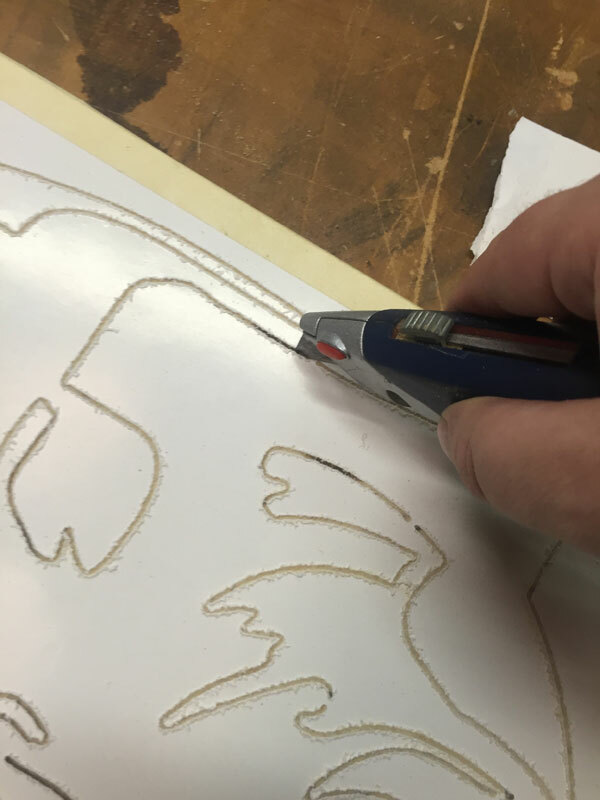 They should come up with a software program for the CW that lets you use Cricut cutting knives to follow a line drawing pattern without the motor running. 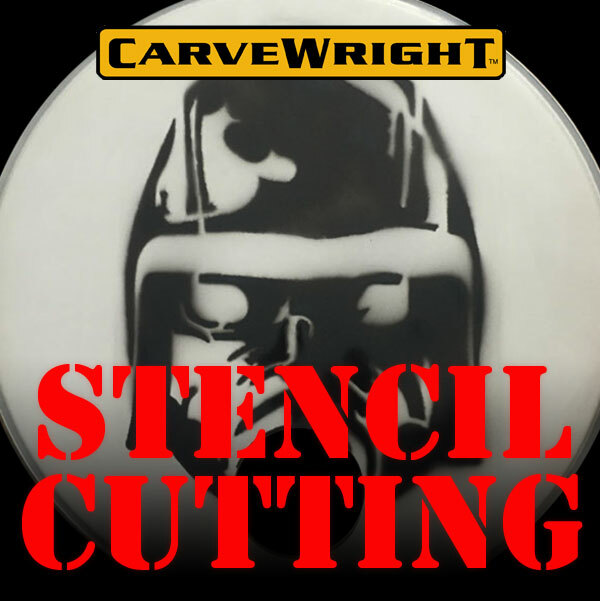 On a cut like this, a drage knife would be the best means of cutting a stencil, not a mill cutter. Great idea and excellent outcome! Thanks for giving us another creative idea to try!